He works in pen and wash, which I also enjoy, but haven’t done for awhile, so I thought I’d stick with pencil and see what took place. I did this one early in July and wasn’t thrilled with it, but since what I turned out yesterday wasn’t thrilling either, thought I’d post this one for something to share. I hope you enjoy it! And if you have any interest in line and wash or quick watercolor sketches, Peter’s channel is a great one to follow. For my fellow art supply addicts, Blick Art Materials extended its Free Shipping on orders of $35 or more through this Monday at midnight Central time. Remember, they do match all art supply house prices if you put a link to the competitor’s offer in the Delivery Instructions window at checkout. I need to place an order myself! World Watercolor Month has really helped me to use up my paints and papers. 🙂 (Note: Purchases from this link helps to support my site and a fledgling art business. Thanks so much!) I hope you enjoy a relaxing, rejuvenating Sunday, and that you find buckets of peace and even a cool sea breeze. Peace. Do you ever do line and wash, Rebecca? I hope you enjoy his videos, although they are probably too elementary for you. I still like his simple approach and I love his pen work! Isn’t it wonderful to have so many products we love?! Oh I just love the possibilities and endless combinations. Love this painting. The sky is beautiful, the sweep of blue beyond the clouds is lovely as is the sparkle of white on the water. Nicely done. Thank you for sharing. Thank you Haunani. Much appreciated, friend. Thanks, Johanna. I love them too! Always have. I’ve thought about doing a series of them. They’re so beautiful and the sea always inspires me. Oh loo. You were not happy with this???!!! It is so delightful!!! The sky is so lovely and the water and the way you sparingly did the building and the lighthouse The greenery is wonderful. What is not to like??? Beautiful! You have become a true artist Laura loo! Woohoo!!!! This is so beautiful! Looks like a postcard I would send. Lighthouses are such great subjects. Very nice. A beautiful summer scene. Makes me want to get in the car and make a trip to the shore….it would take me 5 hours hehe. I will just think about it instead. Thanks for sharing your lovely art Laura and brightening my day. Thank you, Sharon and I will ride shotgun with you!! So this painting ended up in the reserved bucket…hmmm…I think you forgot to wear your glasses, Laura lol 🙂 this painting is beautiful! I can feel the quietness and can only hear the flow of the water. Yes, peace of mind. I love what you wrote above about pleasing yourself and bringing something different…..I just read a book that emphasizes this, that we paint first for ourselves and that includes not being creative to just sell it either! I like that. Your sky is my favorite, it points right to that lighthouse….the color in the water is bright and fresh…..not bright in the normal sense, more of a “glow” if that makes any sense. I don’t like to just use blue for water and you bringing in a green really brings it to life. Which colors did you use for the water? oh I love it when paints mingle, so much fun! I understand what you are saying about the abstracts and realistic. For me going detailed is so boring and I pick on myself more I have noticed. Going loose or abstract is more up my alley…..though I have it in my head that I need to be more realistic to be considered good. Now that is so wrong! I hate having that “inner opinion”! I wonder what Debi has to say about this….maybe once she is freed up from her company we can explore this more in depth with her. Margaret, not sure if you’re a jean Haines fan, but if you are, you should know that Artist Network tv just put up a new WC video with her painting a rooster, flamingo and poppies in her loose, fluid style – with your favorite DS paints! It’s tremendous, had to let you know. I think I need cascade green!! oh that is a color that keeps popping up in comments and seems like everyone wants it as well. I was hoping you could tell me to buy….or not? yes! lol you need my help? I looked it up, it is semi-trans and granulating….yay! I love granulating colors though it has a medium stain. I think that since it is semi-trans, you might want to watch that you mix only with transparent colors and limit how many. I do that anyway regardless of the color specs. It is a beautiful color, isn’t it? It is! Thanks for that info. It seems to have a turquoise underlayment? Is that possible? Sounds almost magical! good eye! at first I was thinking turquoise…what? until I took a closer look and I see what you mean….like I said, good eye! Thanks! When she uses it in the video you can really tell! Not at first, but as it dries. Does she have a youtube station all her own? I keep seeing where a lot of her videos are on Jackson’s art supplies….any idea? Not that I’ve ever seen. I know she’s written books because I own a couple. Been dying to see her work and it was quite educational. If you go to youtube and search on her name, quite a few videos come up! I’d never tried this. she has instructional dvds which I am going to look into 🙂 thank you for steering me her way! You’re welcome! You’ll love her! This is lovely! I want to be there. I’ll check out this artist. Thanks for sharing! I think you did a good job. I understand the feeling you have though. Was reading your response about it not being “your” work. 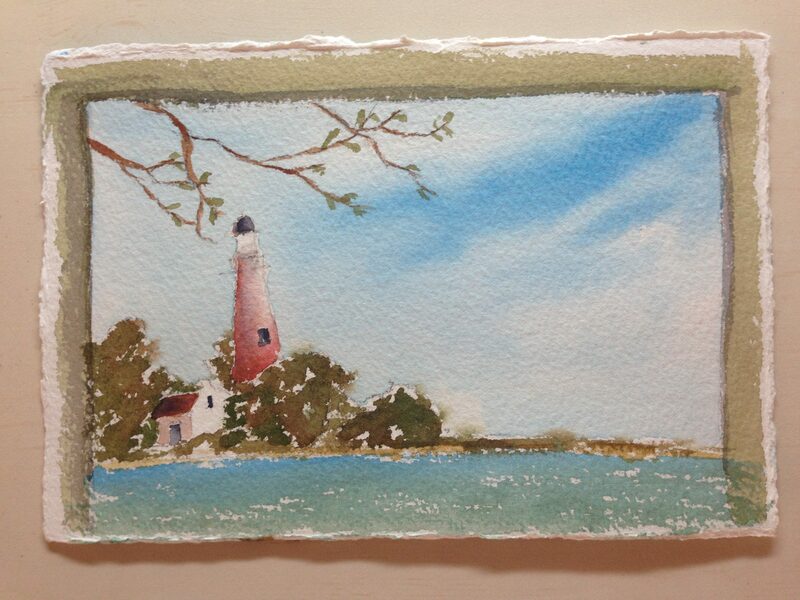 I very much get that, but it did come out well and now you know you can paint light houses. Yay! I love his tutorials also. So easy to follow. Thanks Teri. I’m glad to meet another fan. He’s wonderful!! I love this painting Laura thank to share your art! Thank you Louise! So glad you enjoyed! Boy I would have a tough time, Louise. It’s been over 35 years since I’ve taken classes in French. Beautiful language though. I really like it, Louise, and love the tree photos too! Thanks, Carol and the same to you! Wow! Well done, Laura! I love Peter’s work too – he makes it look so effortless. Yet, when I try, it becomes a disaster. You have a lovely scene there. Keep it up! Thanks, Frank! And I’m so glad to hear you enjoy Peter’s work too. He really does make it look effortless! I love that. Gives me hope it may all be effortless for me too, one day. This is fabulous, Laura!! 😍 I love it! I’m actually not sorry what you did today didn’t turn out now…hehe…because with get to see this one! And yep…that sky is amazing. Love the soft transitions and sweep of clouds. Nice! How pretty! I love water scenes! Thanks, Kerfe. Peter’s work is really beautiful and simply so. His videos make it look so easy, but I think his pen work is what I love the most. Glad you enjoyed it.